Have you ever started reading a book thinking it was the first in the series, but it was not (it is the second)--and it turns out you have the first book in the series on your shelf and had forgotten? Do you stop reading the second book and read the first so you can be sure to read them in order? Or would you keep reading the second book and go back and read the first book second? My husband voted I continue with the second book first since I am already a ways into it. I have not felt left out so far, and so I am going to take his advice. Even though it goes against my preference for reading the first book first--especially since I have it already. Oh well. 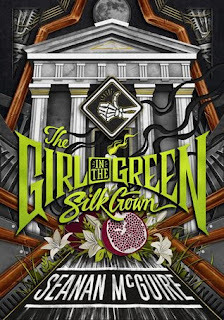 Anyhow, I am reading Seanan McGuire's urban fantasy novel The Girl in the Green Silk Gown about a hitchhiking ghost. I am actually quite excited about this series as it is different from anything else I have read involving ghosts. This is a ghost story. If you're not comfortable with that--if you like the lines between the living and the dead to be a little more cleanly drawn--this is your chance to bail. This is also a love story, in a sideways sort of way, and a story about second chances you never wanted and can't refuse. It's my story. My thoughts: I really like this opening. It isn't often a character talks to the reader this way--or at least that's how it feels. And when it does happen, it doesn't always work out well. It depends on the writer and the "voice" of the narrator. I am immediately drawn into Rose's story and can't wait to know more. I am doing something a little different this week as I am reading two books at once (not counting my two year long reading projects). This second book is my lunch time book, Jennifer Ashley's Scandal Above the Stairs, the second in the historical cozy mystery series featuring Kat Holloway, everyone's favorite cook. Well, mine least. I loved the first book in the series, and am so glad for the chance to read this second one. Cynthia flashed me a sudden grin. "That is because you have no idea what it is like to stride around in perfect freedom, able to go where you please, purchase what you wish, and speak as you wish, because people believe you a man. I'll get you into a pair of trousers yet, Mrs. H."
My thoughts: Men certainly do get away with more than women, especially in the time period Scandal Above Stairs is set in. I adore Cynthia, who thinks nothing of putting on a pair of men's trousers, pretending to be a man from time to time (although I'm not sure how many people she actually fools). And I can't quite picture Mrs. Holloway dressed as a man . . .
What do you think? Do these sound like books you would be interested in reading? I actually have not read that many books that begin with "A"--unless you count the word "a" itself. It just so happens though one of my five star rated books according to Goodreads begins with the the letter "A", however, and so it fit perfectly into today's topic. At least by my Goodreads history, I have only read one book beginning with a "Z"--fortunately, that was a four star read--and so definitely one I can recommend. Anna Karenina by Leo Tolstoy ~ beautiful and enchanting and complex. Loving this book is what motivated me to attempt War and Peace so many times (and this time, I am seeing why so many people love that novel too. It may take me a year, but I will finish War and Peace this year). 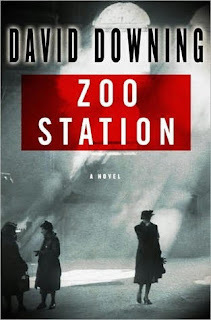 Zoo Station by David Downing ~ The first in a series, this one a mystery set in the pre-World War II era, right in the heart of Germany at a very pivotal moment in time. I appreciated the author's attention to historical accuracy and found this novel to be entertaining and thought provoking. Have you read either of these? What would you say is your favorite read starting with "A" or "Z"? 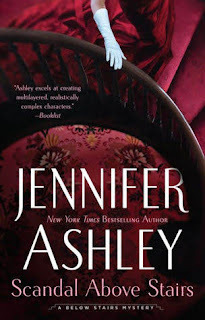 Jennifer Ashley's books looks and sounds very intriguing. I've not read either of your A or Z books, though I'd be more likely to read 'Z'. As to your first or second question - well, I'd probably pick the one you did (or I would today - tomorrow I might have a different answer) and continue reading. I like that opening too. Glad the new Jennifer Ashley book is working for you. So many seemed to love the first in the series. Have a good weekend, Wendy! I haven't reviewed Scandal Above Stairs yet, but I liked it even more than the first book, which I read because of your review! I'm interested in Zoo Station--I love the time period! Jenclair - I am glad to hear you liked Scandal Above Stairs even more. I am really enjoying it myself. I am about half way through now. I would be curious to know what you think of Zoo Station if you do read it. I agree with your husband. I do like to read series in order but, when they're written well, it doesn't really matter. Kathy - I have found that with series books too. I think I'll be okay starting with this one and then going back and reading the first book. It isn't the kind where too much will be spoiled by doing it that way, I don't think. I enjoyed Scandal Above Stairs. I have only read one by Seanan McGuire but I enjoyed it and should read more. This week I am featuring Death and a Pot of Chowder by Cornelia Kidd. Happy reading! Kathy - I am glad you enjoyed Scandal Above Stairs. I am about half way through and loving it so far. The Girl in the Green Silk Gown is my first McGuire book, but it won't be my last. Laurel-Rain - The Kat Holloway series by Jennifer Ashley is so good. I hope you will give it a try. Lark - It does, doesn't it? I couldn't resist it when I first heard about it. World War Z was the book that came to mind when I thought of a favorite "Z" book, but I figured that would be cheating since it didn't actually begin with a "Z". The Seanan McGuire books looks really fun but I'm so excited about Scandal Above Stairs. I love the first book and am really looking forward to reading more. Both books sounds really good! Happy weekend! Freda - They are good! I hope you have a great weekend too. I never thought of reading something else of Tolstoy's but that might be the key for me to also finish War and Peace! I feel like W&P is one of those books that every bookworm feels the inherent obligation to tackle but most aren't successful. I'm hoping I'll be able to fight my past defeats, though, and reading something else of his might inspire me a bit, like it has for you! Thanks for linking up, Wendy! Laura - I think starting with Anna Karenina was key for me. I don't know if it will work for you--but hopefully you will enjoy it if you try it! I started War and Peace so many times only to walk away from it . . . This time I made it farther than I ever had before and I find myself enjoying it. I'm relieved. I don't know that I would try again if this time hadn't worked. I'm usually not so persistent with a book. Ha, I just downloaded the unabridged Audible version of Anna Karenina and narrated Maggie Gyllenhaal... I haven't listened to it yet as the listening length is quite intimidating!! Lisa - I bet that will be good! I know what you mean about the intimidation factor. I have a few longer audio books I've yet to read because of the length. Cynthia sounds like my kind of character. Hope you enjoy your weekend! I don't read more than one book at a time often but I have done it on occassion. These both sound great. I doubt that I have read many books that start with a A or Z myself. I've not read either of your A or Z books though both would suit different reading challenges I've got going on at the moment! I've been hearing alot about the Jennifer Ashley book. It sounds really good. Have a great week! Yvonne - I have enjoyed the series to far! I hope you have a great week too! I think my comments keep getting eaten.... great choices though! Anna Karenina is one I need to read. Enjoy your books, I have been eyeing the Jennifer Ashley series. I've wanted to read Tolstoy for so long, maybe one day. Naida - Ashley's series is a good one. I highly recommend it if you get the chance! Ack, I can't think of any A to Z titles right now but I'm sure as soon as I hit submit, I'll remember! haha... You know the same thing happened to me recently with a series. I was sure I was reading the first one and it turned out I wasn't not! Had to put that one aside and re-start the right book. Iliana - I cheated and had to look at my Goodreads books to come up with the titles. Thank goodness for tracking! Beautiful roses-- I know they're a bit fussy to grow properly! Also, love your new kitty, how cute! We just got a new cat, but he's already 1 1/2 old, and still acts like a kitten.